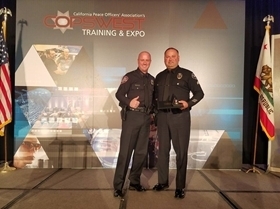 On behalf of the Irwindale community, I extend my congratulations to Irwindale Police Department Detective Manuel Campos and members of the Azusa Police Department who were awarded Medals of Valor by the California Peace Officers Association at the CPOA's Awards Banquet in Palm Springs this week. The Medals of Valor stemmed from the officer's courage under fire during an active shooter incident in the city of Azusa on Election Day 2016. I was honored to be on-hand when Detective Campos and the Azusa PD officers received their recognition and I am proud of their heroic actions during this event. Congratulations to IPD Detective Campos and Azusa Police Department officers Lieutenant Torres, Sergeant Smith, Sergeant Weinrich, Corporal Chapman, Corporal Rodriguez and Officer Plascencia on their awards.